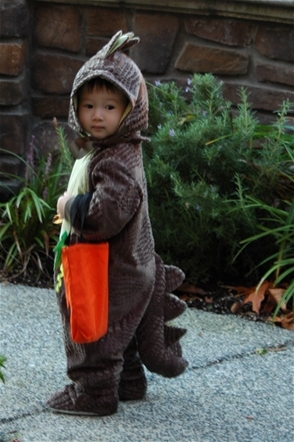 Here’s Noah in his dinosaur costume (that Amy sewed herself–isn’t it amazing!?). AMY!!! AMAZING JOB!!! what a scary dinosaur! i bet he got lots of treats!! That is totally awesome, Amy! Looks like Halloween was a blast. Are you kidding me? Are you kidding? Supermom, will you ever cease to amaze me? mother of two!! when do you find the time to sew!! super impressed. you are indeed super mom.